Our company has gained name and fame in presenting Mens Denim Jeans. Keeping the diverse requirements of customers in mind, we are instrumental in providing Men's Denim Jeans. Highly Designer Jeans, CK mill fabric!! Washed Denim!! 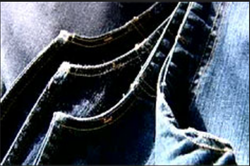 We are engaged in offering a quality approved range of Low Waist Casual Jeans.